This page is a walkthrough of MealPlan's features. 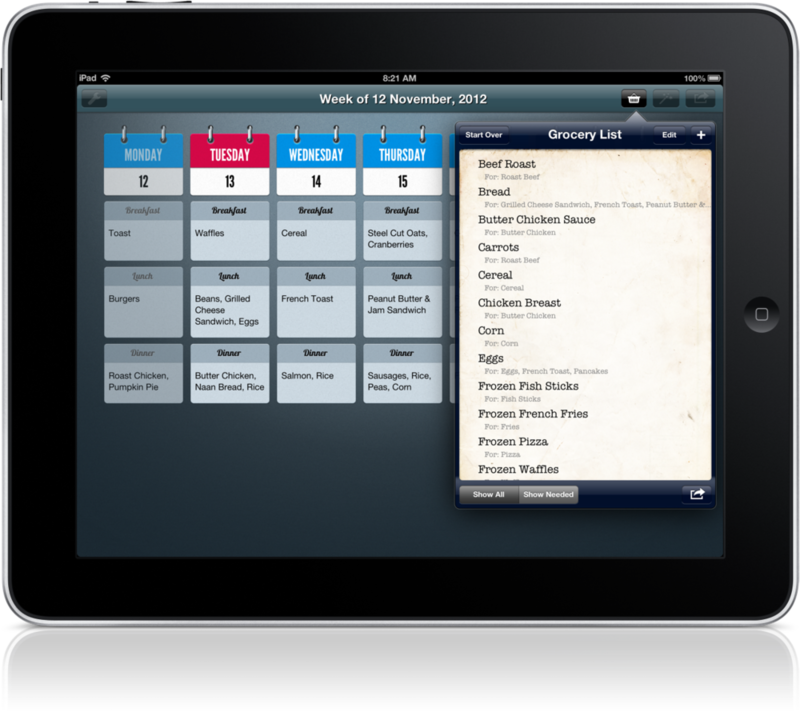 It shows how to do your weekly meal and grocery planning using MealPlan on your iPad. Here's the Week View, which shows you one week's worth of meals. You can swipe left or right to view adjacent weeks. If you want to move a meal from one day to another, tap and hold on it for a second, and then you can drag and drop it into a new location. Tap on a day, and the view transitions to the Day View. Here you can see the meals for the current day, and a big list of recent meals. To pick something to eat for breakfast, lunch, or dinner (or whatever meals you have configured - you can change these default meals in Settings), simply hold your finger down on one of the blue meal names, and drag it to the meal slot. Drag and drop all the meals you want for this day. When you're done, tap the arrow at the bottom right to return the Week View. What if the meal item you want isn't already in the list? Tap in the text entry box at the top right corner, and type in what you're looking for. As you're typing, if it already exists you'll see it show up below the text box. At any time you can drag from the area below the text box over into the meal slots. This is how you add new meal items. You can fill in all the meals for the week by tapping on each day and dragging and dropping, but there's another tool that can save you a lot of time. The Magic Wand will fill in an entire week's worth of meals for you, based on your past meal choices. The Magic Wand suggests meals for you. When you tap the Magic Wand button (at the top right), if the app has enough data to work with (about a full week's worth of meals, in every meal slot), all the empty meal tiles will flip over and fill in with suggested meals, and turn yellow. You can tap on any yellow tile to "lock" that tile, and then tap the Meal Wand again to fill in all the yellow tiles with a new choice. You can keep doing this until you've filled in all the slots you want, and then tap Keep Locked to save your choices. (The Keep All button will keep all the yellow tiles, not just the locked tiles). That covers basic meal planning. Now let's look at Grocery Planning. Every meal has "grocery items" associated with it. When you're in Day View, tap a meal slot to see a pop-up menu. Tap on a meal, and you'll be in a view where you can add or edit groceries and notes for that meal. Picking Grocery Items for a Meal Item (in this case, the meal "Meatballs" needs grocery item "Frozen Meatballs". Here you can see we have "Spaghetti, Meatballs, Texas Toast" for dinner. Meatballs has a grocery item, "Frozen Meatballs", that will show up on the grocery list when this meal is in the meal plan for the week. When you add a new meal, remember to add the grocery items for that meal so they don't get missed in the grocery list. Tap on the meal slot, tap on the meal item you added, and add the grocery items. You can also add a note here, and notes can include web links - perhaps to your favourite meatball recipe. If you add a link here, once you're done editing, it will turn blue. Tap and hold on a blue link to see the options (including opening it and copying it to the clipboard). Let's take a look at the Grocery List. The Grocery List appears when you tap the shopping cart. When you're done planning out your meals for the week, tap the shopping cart to show the Grocery List. There are two ways that items are added to your grocery list. Items required by the meal plan (for example, you added Hamburgers to the meal plan and this added Hamburger Buns, Lettuce, Tomatoes, and Ground Beef to the grocery list) are added automatically. You can also press the + button at the top of the grocery list to add an item. You'd use this for items you need to pick up at the grocery store, but that aren't on your meal plan - an example would be laundry soap. The Start Over button resets your grocery list to just the items on your meal plan. Press it, then tap on the items that you already have to cross them off, and what you're left with are the items you need to buy for the week. Print or email the grocery list to your phone so you have it with you at the grocery store. You can reorder the items on the grocery list by tapping the Edit button and dragging them up or down. You can save time in the grocery store by ordering the items to match your store's layout, and MealPlan will remember this ordering for next time. If you're not able to use iCloud to sync (for example, because your iPhone is on a different iCloud account than your iPad), MealPlan also supports creating reminders for your grocery list. Tap the Action button at the bottom of the grocery list, and one of the options listed will be "Send to Reminders". This will add your current grocery list to the Reminders app on the iPad. From there, if iCloud syncing of Reminders is enabled, the grocery list will automatically synchronise with the iPhone. And, you can share your MealPlan Grocery List reminders. Sharing reminders can't be done from your iPad. It can be done from the iCloud.com website, or from the Reminders app on the Mac (if you're running Mountain Lion or later). On either iCloud.com or in the Reminders app on the Mac, hover the mouse over the right side of the MealPlan Groceries header, and a sharing button appears. Tap this, and enter the email address of the person you want to share with. Here are some questions we've been asked. Why does the magic wand 'fizzle'? The magic wand saves you time by automatically suggesting meals for every empty meal slot in the current week, but to do this, the wand needs data to work with. Specifically, for every meal slot (for example, Breakfast, Lunch, and Dinner), it needs at least 6 unique meals at some point in the past. Normal use of the app for a week or two will provide enough data for the wand to work with, or you can go back a week or two and fill in some past meals to provide the wand with some data. Printing is supported through Apple's AirPrint printing protocol, which requires a compatible printer. If you have an AirPrint compatible printer, printing should just work. If you don't, you can use the Email function to mail yourself a copy of the meal plan or grocery list, and print that from your computer. If there's something about using MealPlan that still isn't clear, or if you have any questions, please Contact Us.